Dulce de higos, also known as higos pasados, are fig preserves cooked in spiced syrup of panela/piloncillo or brown cane sugar and spices. They are a very typical dessert in Ecuadorian households, and are one of those desserts that you might be served both in the home of humble farmer who lives in a house with no electricity, or at a fancy dinner of a wealthy businessperson in one of main cities. Personally I would choose the figs served in a humble home o from a small local vendor, from my experience those are usually the best. 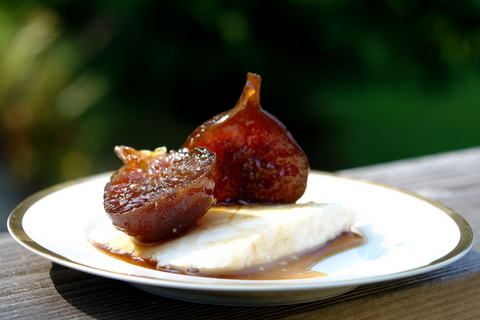 These caramelized figs are usually served with a slice of fresh cheese, queso fresco or quesillo, to help balance the sweetness. Dulce de higos or fig preserves in spiced syrup are made by cooking ripe figs in a syrup of panela/piloncillo or brown cane sugar and spices. 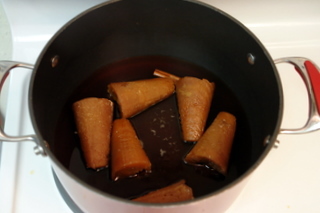 Place the panela or hard brown cane sugar and the spices in a large saucepan, cover with about 6 cups of water and cook on low heat until the panela is completely dissolved. 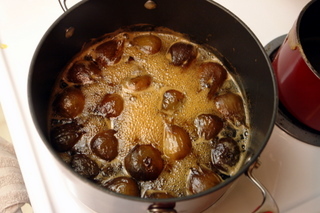 Add the figs and simmer until the panela syrup begins to thicken, at least a couple of hours, stir occasionally. Anyone familiar with traditional South American desserts knows that we prefer to keep them simple, especially since the main meal tends to be very filling. Desserts were not necessarily an expected component at the end of each meal and when we did have dessert it always felt like a special event. A typical dessert in Ecuador might be a perfectly ripe fruit, such as a slice of papaya with a drizzle of lime juice or a piece of babaco with a little bit of honey, or maybe a refreshing helado de paila, a fluffy bizcochuelo, a crunchy cocada or a sweet fig preserve served with a piece a quesillo or queso. It is also frequent to eat sweets in larger quantity with afternoon coffee rather than for dessert, after a large meal sometimes you want just a little something sweet that adds that finishing touch and doesn’t leave you feeling like you had too much. 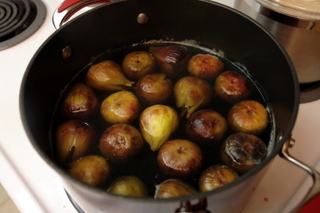 The fig preserves are made through a 3 day process:first they soaked in water for a day, next they are boiled in water, then left to soak another day, then drain and finally boiled in the syrup made with the panela and spices. 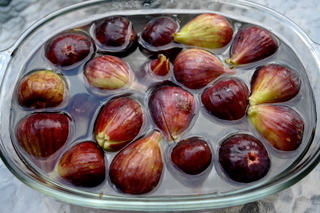 It is very important to let the figs soak enough, this helps keep them tender, I’ve tried to take shortcuts before and ended up with very dry and rubbery figs. 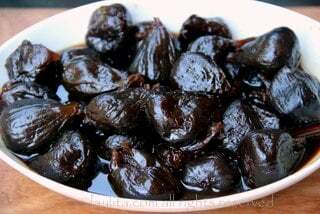 The spices are optional and the figs taste just as good without them, so it’s just a matter of preference, I personally love adding the spices, but since my husband had this annoying dislike for cinnamon I sometimes make them without any spices. These figs are very sweet, you can reduce the amount of panela if you would like them to be a little bit less sweet; also because they are so sweet they are much better eaten with cheese or even with bread than alone. 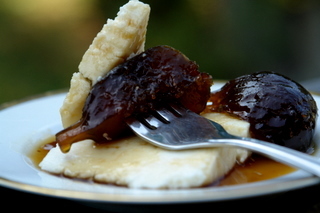 Dulce de higos are usually served with generous slice of fresh cheese called quesillo, you can use fresh mozzarella instead of quesillo, some other good options include queso fresco, farmer’s cheese or curds; you can choose your favorite cheese or also try these fig preserves with a few different types of cheese. Hello. If we don’t have access to panela, how can we use white sugar instead of it? How much sugar and how for 20 figs? It would be best if you could use brown sugar, about 3 cups. I live in Cuenca, Ecuador and made these since figs are in season and they are everywhere right now. I used some cinnamon and allspice, with “panela negra”, which is sold here in the Andes. It worked great with the “green figs” I have in the yard, (but they can’t be too ripe or they just dissolve). 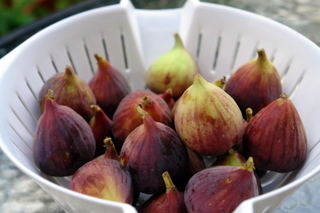 Everyone loves the figs and it is well worth the three days to get it right. Trying this for the first time. Why do we drain the water after cooking the figs the first time? Wouldn’t there be more fig flavor if we just added the sugar to that water to make the syrup? You can probably use the water from the figs, it just isn’t the way I was taught how to make them. I’m pleased with my first batch; thank you for your recipe. I encountered this dessert in Quito and am tickled to be able to recreate it. In Quito it was displayed and served unrefrigerated in a bowl on a counter in a bakery. Would you let me know if the figs should be refrigerated: 1. When they are first soaked?, 2. After they are cooked and soaked the second time?, 3. When they are finished cooking and the recipe is completed the third time? Your assistance is greatly appreciated. It is a beautiful elegant dessert. Hi Sarita – In Ecuador they are usually never refrigerated during any part of the cooking process or when they are done. The temperature (at least in the Highlands) are not extremely hot. In the US (during the summer – which is when I prepare them) if I have space in the fridge, I do refrigerate them during the first soaking (just as an extra precaution, though I’ve made without refrigerating at all and they were also fine). I also keep them in the fridge once they are ready, just so that they last longer, but will bring them to room temperature or heat them slightly before serving. Once they’re cooked, you can treat as you would any other fruit preserve. While visiting your site I decided to return to my favorite fig recipe. In Colombia my mother used to make stuffed figs with arequipé or dulce de leche, which I continue to make every Christmas. Although I’m not able to get imported preserved figs from Colombia any more since the store owner who used to get them for me is no longer in business, this recipe has served me well. I must admit that it took me several tries to get the result as seen in the final picture above. My unsuccessful attempts weren’t due to the recipe but the quality and ripeness of the figs. My initial attempt using too ripe of a fig ended as fig sauce rather than fig preserves. The important key words in your recipe are “fresh ripe but firm figs”, which resulted in a successful outcome. I just made some with my walnut/big olive size green figs. I cut the stem and washed them in cold water until the white sap was gone. Poked with a fork each one, then boiled for hours in a mixture of water and sugar with a pinch of salt. When tender and sweet I added lemon zest and cloves. Transferred to a jar and let it cool. Seal it. Will save in the fridge, but I don’t think it will last long enough. Someone told me it was good with plain yogurt and boy it is amazing! This recipe is very close to the way I heard my mom makes it back in Ecuador. It is really good. Thank you! I just have a couple of suggestions from a person (me) who is not a great cook, but wants to give it a try. I hope I made sense. Thank you for writing down the Ecuadorian recipes. I am sure this is not an easy task. My figs are ready now. They taste great! I love figs! This looks like a very interesting way to prepare them–especially with the cheese. Lovely photos too! I am making these right this minute! I can’t wait until they are ready…in a few days! 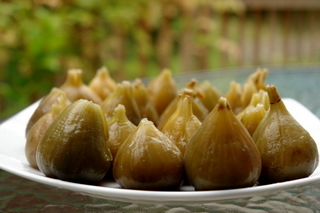 My aunt used to make this since she had so many figs… good memories oooh they were so good! I better leave your site now, as it’s making me hungry again even after just getting done with my dinner. Maybe I can have a little of that yummy custard my sis-in-law made after New Year. If anyone knows an Ecuadorian restaurant where I can try one or two of the recipes heres, I’ll greatly appreciate. Thanks so much! Anyone know where i can buy these in jars? I am running out of time before the office Xmas party. My husband and I first tried these 8 years ago when we bought them from an old lady in Ecuador. We didn’t think we would ever eat them again (we have searched and searched to find any that tasted that good) but I’ve just finished making them from your recipe and they taste exactly as they did then. Thank you so much! My husband is going to love them. You forgot the tall glass of milk! Your are wonderful..supreme. I live in Bali and have some lovely flower shops here, we are opening a small wine bar in the shop and I came across your site while looking for ideas for empanadas. We have a limited kitchen and thought those could be great as a snack with the wine………..I was wondering about those lovely figs in syrup…….we can’t get fresh figs here..can dried turkish figs work at all….we have the most wonderful dark palm sugar here which looks just like your sugar cane cones……..but dried figs….let me know what you think. I had this the other day at an Ecuadorian restaurant. It was heaven on earth. Thank you so much for the recipe. We recently rented the home we are living in and suddenly became blessed with an overabundance of figs. I had never canned before in my life. I have canned now 5 quarts and the figs keep on coming. 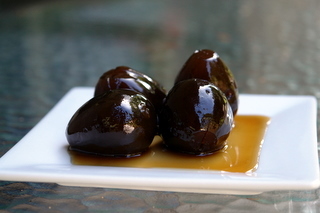 Our new neighbor is from Equador and she took some green figs from the tree ( they are black mission type) and made what appears to be this recipe and they were amazing! Thank you for this recipe, I just hopes it works as well for me. Thanks for posting this recipe. I had tried to make this before, without success.This time around everyone who tried the figs loved them. I did add a little vanilla and rum flavor, to experiment. It came out exquisite. I’m in the market now with a flat of figs in my cart! Can’t wait to try these! I have been secretly stalking your website on and off for several months. I spent a semester in Cuenca with a host mother who was an amazing cook. 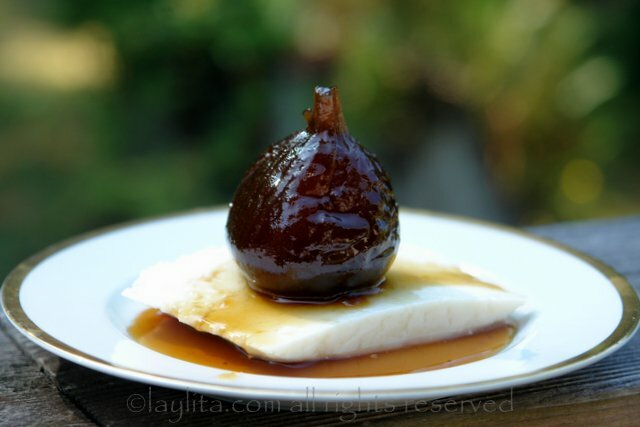 I had all but forgotten about dulce de higos until I saw it on the kitchn.com. I have also been obsesssed with pan de yuca and will some day try to recreate both of these. Thanks also for having the directions, as my host mother was very vague with her instructions. 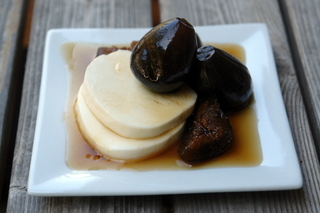 A friend of mine gave me some fresh figs from her mother’s backyard and I tried this recipe. All I have to say is UMM UMM good!!! Even my 12 year old nephew loved it. Thank you. That looks wonderful. I love your photos. I like the Fig and Cheese combination, so beautiful and elegant yet simple. Thanks! Wow! Looks like a real treat! Love the photos, too! Love, love this. So beautiful. We’re not big dessert people too, so something simple like this always hits the spot at the end of a meal. Those pictures are truly amazing, especially the first one on top. I really enjoy learning about your homeland traditions, very nice. I just came across your blog and immediately appreciated the photos so I quickly subscribed so I wouldn’t miss future posts — and now I’m going to leisurely look through your past posts. Rosa – Thank you, it is a great combination! Lucy – I haven’t mail ordered any of the ingredients, I’ve been lucky to find most of what I need in the latin grocery stores here, I would check the sites of makers of the products (like Goya to see if they ship any orders or maybe they can tell of stores local to you that sell their products), I also saw that there is a site that specializes in Ecuadorian food items (http://www.ecuadorianfooddelivery.com), but I have not purchased anything from them so I don’t know if their products are good. For aji, I just use the hot peppers I find locally (serranos are my favorite), but you could also try getting some aji seeds from Ecuador and growing a plant (even in a container if you don’t have a garden or so you can bring it inside during the winter) – that’s my plan for next year. Another idea is if you know of an Ecuadorian restaurant (or Peruvian or Colombian) and ask them where they buy their supplies. Good luck! 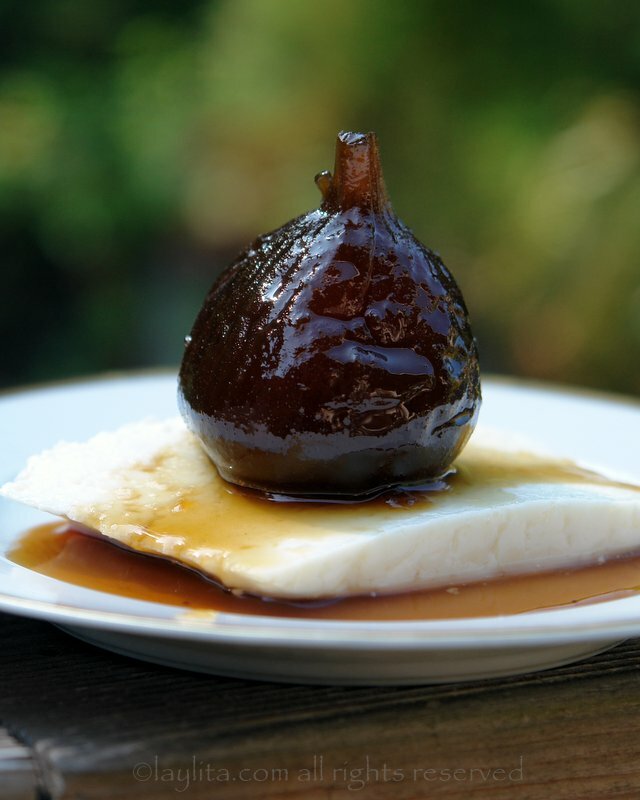 Paulj – The best figs I’ve found here are at Costco or ocassionally at the local farmers market – you can ask them to pick them for you before they’re too ripe, also while cooking the figs they did look very fragile but once they cook in the panela syrup for a while they get a little bit firmer. Yes, the panela has several names and shapes, occasionally I can find the square shaped one that looks more like the typical one from Ecuador. I’m guessing that the squash dessert your talking about is dulce de zapallo or sambo, it is also one of my favorites! 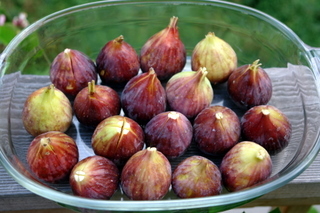 Amrita – Thank you for stopping by, the figs are just as good as they look (if not better). Anticiplate – Queso fresco is so good with these, also one of my favorite queso frescos is a local one (well local from Oregon) called Froylan, it makes all the other queso frescos seem so boring, I also find it the latin grocery store. 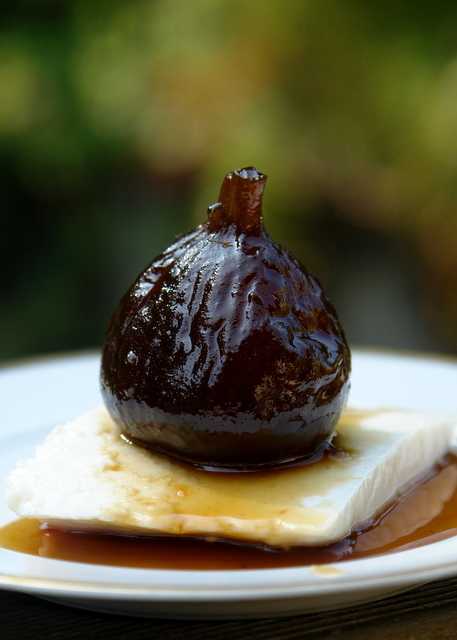 Those figs doused in syrup look gorgeous…and with cheese! Yum! The figs that I find in the US markets always seem too ripe to handle this type of cooking. A minute in the microwave with some syrup or honey is about all the cooking they can take. I believe the cone shaped piloncillo from Mexico is the same as the Ecuadorian panella or raspadura, except for shape. It is fairly easy to find in the Hispanic section of many groceries. I have also seen bowl shaped blocks of this sugar from Columbia in shops that specialize in pan-American products. Following a recipe in a cookbook that I bought in Quito years ago, I have made a sweet like this using winter squash. Just cut the squash into large chunks and poach in the same syrup. Hi. I was wondering if you have any ideas about mail ordering some of these ingredients, such as the sugar used in this recipe (my favorite dessert), or tomate de arbol concentrate, etc. I live in the Northeast now, but lived in Quito for a year of college and I miss the food so much!! We do have aji delivered whenever our Ecuadorian friends come to visit, but I would love to make some of my own. Any ideas? Those figs look delicious! Mmmhhhh, with fresh cheese, it must taste fantastic!